← Halloween is over I know but…. We’re in Spain….. after 13 hours to Dubai, another 5 to London, a bus to Stansted, a night in the Hilton and another 2 hours on a budget airline to Spain (not forgetting all the waiting in queues, and passport checking included with each flight). We had to wake early, I can’t remember the exact time, it was definitely dark and definitely early. We had ordered a room service breakfast……. toast, cereal, fresh juice, yoghurt, COFFEE, best idea ever!! We ate and repacked our mountain of luggage (It’s surprising how much you have to unpack just for one night) ready for our morning flight. We catch a bus with fellow bleary eyed travellers and haul ourselves, children and luggage onto the bus, off the bus and into Stansted Airport. My concern at this point is the luggage allowance. Long hall flights generally allow more than budget flights and I’m thinking we’re gonna be handing our credit card over to pay excess!! Luckily no… so our first obstacle out of the way. The flight is pretty smooth. It’s my first experience with the dash for seats on a ‘no seat allocation’ flight. It’s pretty funny, and a little stressful when you need to sit in a four! As it was, we got our four seats and our friends sat accross the aisle, so a very fun flight. Those of us who weren’t directly responsible for children (everyone but me) drank spirits out of little bags (baggies) at around 9 am! Upon landing we gather all the paraphenalia we seem to need to entertain D for the flight and head for the terminal. For some reason our passports aren’t checked, and are feeling pretty lucky as we go to collect our luggage. Still feeling lucky as all eight of us find all our luggage with none lost or damaged. There’s a bit of mucking around as we get money and figure out where we are, where we’re going and how to get there. We are going to a Spanish Villa 20 miles (ish) from Santiago de Compostela and the best possible (actually only) way is by Taxi. We don’t have a baby seat…..
We decided against taking one as the majority of our travels were going to be in planes and trains…. NOT automobiles. Oh no we are literally stranded at the Santiago de Compostela Airport. While trying to decide our next move we make our first attempt at ordering Spanish food, a baguette with ham and cheese (the cheese turned out to not be cheese, but the fat on the proscuitto) which I had to replace with the jam I’d pilferred from the room service tray (yes I’m a food hoarder!). Our tummies are taken care of… but we’re still stuck. We walk along the massive line of taxis asking if they’ll take us….. but alas….. none want to do the ‘wrong thing’ in front of all the others. We’re not here alone…. there are numerous friends and family descending upon Santiago de Compostela for this wedding… why don’t we call someone? It was another while, but they came, and bundled me with the boys into the car, while the rest of us took a cab. After a surreal (and rather jet lagged) drive, watching my cousin drive in the wrong side of the car and the wrong side ot the road, we wove our way along the dirt driveway surrounded by the most beautful… Eucalyptus trees? Hang on, I thought we had just travelled for 2 or 3 whole days away from Australia……? 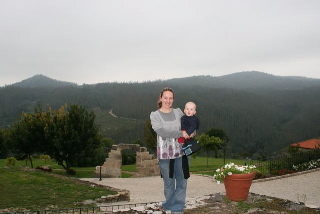 This entry was posted in Travel tales and tagged Spain, Travel Stories. Bookmark the permalink.